Prime Minister Ibrahim al-Jaafari says Monday he is the candidate of the people. BAGHDAD, Iraq (CNN) -- Iraq's prime minister said Monday that he has the support of the Iraqi public and gave no indication that he would step aside despite strong opposition from some Iraqi political parties. The United Iraqi Alliance, which won a plurality of seats in December's election, chose Ibrahim al-Jaafari as its candidate for prime minister in the new four-year government. Sunni, Kurd and secular Shia parties have objected, citing al-Jaafari's performance in his 11 months as interim prime Minster. 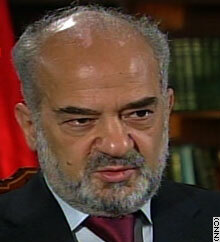 Al-Jaafari is a Shiite and a member of the Dawa Party, which is part of the United Iraqi Alliance. "I was nominated by the United Iraqi Alliance," al-Jaafari told CNN. "What does it mean that the UIA controls the majority of parliament? It was the choice of the people, and the UIA chose my name. "Had they chosen another person, I would have fully supported him. ... I support the desire of the people. I represent the people's choice." The 275-member parliament is scheduled to convene Thursday to begin the arduous process of selecting a new government. That process begins with the selection of a president and two vice presidents, who then choose the prime minister. The constitution allows for the process to take 60 days, but all parties want to have the players in place before the first official vote. With the help of followers of firebrand Shiite cleric Muqtada al-Sadr, al-Jaafari eked out a win over Vice President Adel Abdul Mehdi as the UIA prime minister nominee at a recent coalition meeting. The UIA gets the first crack at forming a government because it won the most seats (130) in December. "I respect this opposition," he said of the burgeoning coalition forming against him. "[But] we are acting in accordance to the constitutional law." The United States has played mediator in recent talks between the Iraqi lawmakers. "Everyone agrees that the prime minister has to be someone that can bring the country together, someone who is competent in terms of dealing with the problems of Iraq -- and that the person has to be from the largest bloc, and that is the UIA, the Shia alliance," U.S. ambassador to Iraq Zalmay Khalilzad told CNN's "Late Edition" on Sunday. "And as I said before, this is an issue that will have to come up in the coming days and be agreed to." A spokesman for one Sunni party, the Accordance Front, told Reuters he didn't think an agreement could be reached by Thursday. "The meetings will be hours and hours long, all leaderships will meet at one table in order to agree," Zafir al-Ani said. "We wish we could reach a deal by Thursday, but I think it will be very difficult." Despite the political wrangling, al-Jaafari predicted the process of forming a new government should not take more than a few weeks. "There are many steps ahead of us -- steps of negotiations between political leaders -- which started within constitutional law and require that we put aside personal differences," he said. "If we respect the constitution in its detail, we will not require more than a month to form a government." Al-Jaafari also acknowledged a "risk" of civil war and "an escalation of violence," but denied that Iraq had fallen into civil war. On Sunday, six car bombs exploded in a Shiite slum in Baghdad, killing at least 46 people and fueling fears of increased violence between Muslim groups. Al-Jaafari also denied an accusation by U.S. Secretary of Defense Donald Rumsfeld that Iranian military operatives were operating inside Iraq. Rumsfeld told Pentagon reporters last week that "Iranian Quds-force type people," a division of Iran's Revolutionary Guards, have gone into Iraq. Al-Jaafari said there was no evidence foreign terrorists were coming into Iraq from its neighbor to the east. "We have not seen any Iranian groups from Iran carry out terrorist attacks," he said. "But the terrorists are coming through the Syrian border and are of different nationalities. "But the numbers of those who come across the border and carry out suicide missions and car bombs has started to decrease."